We love to see you at our annual Flower Event from 5-9 November. A week full of flowers, meetings, field trips and fairs. 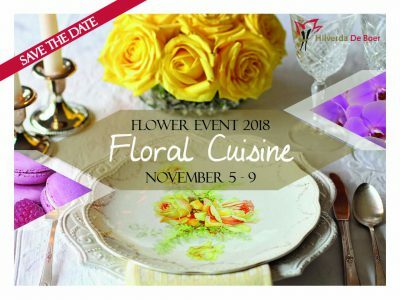 Visit our Flower Event ‘Floral Cuisine’ from 5-9 November! Are you a regular visitor or will this year be your first time? Our Flower Event is a great way to meet old friends and new flowers! Get excited, make your reservations, and have a great week this fall. We love to see you at our annual Flower Event, a week full of flowers, meetings, field trips and fairs.